A confluence of factors have left governments across Europe facing stark new challenges when it comes to communicating with constituents on matters of immigration and integration. The 2015–16 migration crisis elevated public and political attention to immigration-related issues. Deepening political polarization and the harsh rhetoric of anti-immigration populist politicians have reshaped even mainstream narratives about migrants. And a rapidly evolving media landscape has seen a proliferation of new and often unvetted sources, accelerating news cycles, and ever tighter deadlines. Policymakers working to support the integration of immigrants into European societies have felt the effects of these trends keenly. Immigrant integration is a highly emotive policy area, interwoven as it is with economic, security, and cultural politics. And even as these policymakers work to effectively communicate with the public about the challenges they are facing and their proposals to address them, there is little consensus on what constitutes successful integration or how it should be accomplished. 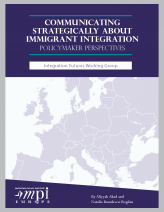 This report takes stock of the communication strategies and common narratives employed by integration policymakers, as well as the slew of obstacles that can lead messages to be misremembered, ignored, or inadvertently inflame tensions. It draws on insights shared in interviews by policymakers and communication experts as part of MPI Europe’s Integration Futures Working Group. Among the key lessons of this analysis: messages that are overly positive may be perceived as disingenuous or out of sync with on-the-ground realities, while those that fail to tap into an audience’s lived experiences or that do not come from a trusted messenger are likely to be dismissed. And though communications strategy and outreach are sometimes viewed as an add-on to well-crafted integration policy, they can be integral to its success—or failure.